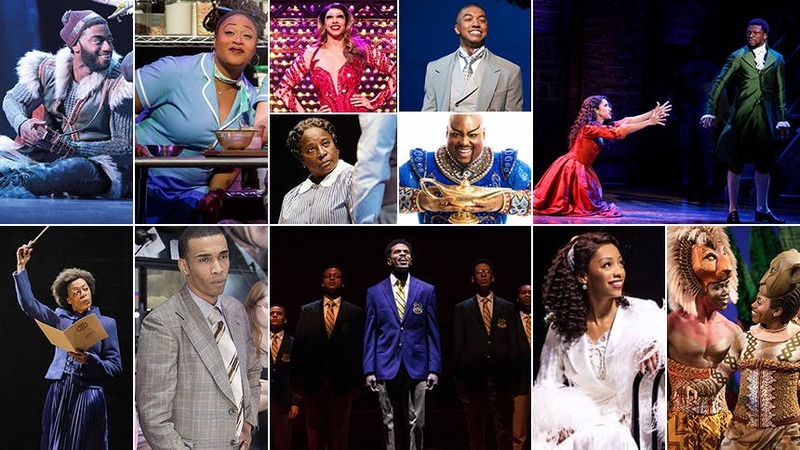 It’s February 1, officially the start of Black History Month, and we are kicking things off with a look at 41 African American actors and actresses who are currently playing a principal role in a Broadway show right now. Known for TV roles on The Wire, The Deuce, The Good Wife, Graceland and Nurse Jackie, Gbenga makes his Broadway debut as the young man on trial in the beloved Harper Lee classic. Jelani makes his Broadway debut as the romantic lead of Disney’s hit musical adaptation of the animated film Frozen. Jelani originated the role and will play it through February 17 when Noah Ricketts takes over. (Ok, Kiss Me, Kate doesn’t start until February 14, but we are counting it). Last seen in Broadway’s Rocky, Terence plays Kelli O’Hara’s stuffy fiancé in the RTC revival. The first of many Broadway debuts from the nearly all-black cast of the acclaimed Broadway production of Choir Boy. Nicholas (known for the TV series Queen Sugar) wins audiences hearts as the adorable sidekick, Junior. Major Attaway slayed us when he made his Broadway debut as the Genie in Aladdin. The longtime Genie leaves the lamp February 14 with Michael James Scott stepping in on February 15. The Great Comet Tony nominee returns to Broadway as Eliza, serving us some stunning vocals and strong performance. Phoenix is perfectly adorkable as over-achiever Alana in the heartbreaking & Tony-winning musical. We can’t wait to see what the Holiday Inn and In the Heights alum does with this big, flashy dance role. More people need to be talking about Joshua’s performance as the cut-throat, Machiavellian TV exec in this hit adaptation of Network. The Holler If Ya Hear Me alum is equal parts alluring and ruthless. The Tony nominee (known for his performances in Shrek and Passing Strange) stars in the Tony-winning role of Burr. His “Wait for It” is absolutely epic. Another Choir Boy debut from John Clay III. He plays the straight, jock roommate who everyone wishes they had in their corner during high school. The Tony Award winner plays a sympathetic, caring, and just headmaster of the all-boys prep school in Choir Boy. When Charity belts “I Didn’t Plan it” as the no-nonsense diner waitress Becky, you can feel it in the theatre. Her voice is that powerful. The two-time Olivier Award winner reprised her Olivier-winning performance as a grown up Hermione for Broadway audiences, and scored herself a 2018 Tony nomination. Guessed it again, another Choir Boy debut from this singer/actor. Caleb plays David, a deeply religious teen with a secret past. Kim Exum makes her Broadway debut in the Tony-winning role in the Tony-winning blockbuster musical. After starring in the London and Australian productions, Callum brings his award-winning Lola to Broadway, and the children are LIVING for this fierce debut. For his performance as Simba, Bradley was named one of our favorite replacement stars of 2018. You have to see this king in action. The Oscar winner has done two tours of Broadway’s Chicago and opened the newest London production. He stars through February 10. The acclaimed musical marks the Broadway debut for this charming and funny actor, photographer, and podcaster. Susan brought this smart and determined character to life for Broadway audiences as part of the OBC of this Tony-winning theatrical event. A Tony winner for his performance as the Genie in Aladdin, JMI brings all that energy to this Tony-winning supporting role. His “What’d I Miss” will have you smiling from ear to ear. This Tony nominee brings such dimension to the beloved character of the Finch family caretaker. The award-winning Canadian actor makes his Broadway debut singing LOL obscenities as Nabulungi’s father in the hit musical, a role he also played in Canada. This Hamilton alum plays the bully of Choir Boy and does a damn good job at it. Joanna could be a recording sensation, but we are blessed that she’s on Broadway right now. The School Girls alum takes that money note in “Say No to This” to the next level. The A Chorus Line and Scottsboro Boys alum has the showstopping Cole Porter number “It’s Too Darn Hot”. The former subway & street performer now makes his Broadway debut as America’s first president in the biggest hit—if that’s not what this show and this country are all about, what is? It’s a Broadway debut for Sky, who lands laugh after laugh after laugh as the title character’s tech-savvy family friend. Michael broke out onto the scene with his incredible performance in off-Broadway’s Invisible Thread and now he makes his Broadway debut as the title character in Hamilton. The actress from Johannesburg has been with The Lion King since the Toronto production opened in 2004 (15 years!). That is a lot of “Circle of Life”. Julian makes a striking and commanding Broadway debut as Bryan Cranston’s TV producer in the stylish new play. What in the world can we say about Christiani that we haven’t already said (twice!)?! The A Bronx Tale alum completely reimagines this iconic character for today’s audience, and it’s better for it. Jeremy Pope gives a Broadway debut for the books as the proud, gay teen in this drama from Moonlight’s Tarell Alvin McCraney. What’s most insane: Jeremy immediately jumps from this show into the Temptations bio-musical Ain’t Too Proud. She has been with this show from day one, and she still brings audiences to tears nightly with her performance as a mother who lost a child during 9/11. A Broadway mainstay, Wallace has previously starred in Godspell, Les Miz, Hair and The Lion King. Now he brings comic relief to musical theatre’s most incredible history lesson. The King of Pride Rock first made his Broadway debut in the Disney musical back in 2006, and took over the role of Mufasa back in July 2015. The Lion King alum kicks off the RTC revival with the big opening number “Another Op’nin’ Another Show”. Christian brought those soaring vocals to the Hello, Dolly! revival when he played Cornelius, and now he’s bringing them to the Beaumont for LCT audiences when he sings “On the Street Where You Live”. Chicago audiences are in for a treat because NaTasha brings her killer pipes to her role as The Countess of the Clink. This singer and actress has appeared in Broadway’s Hamilton, Pippin, & Motown, and now she slays Disney audiences with her “Shadowland”.